Help me out here, how does the saying go? Repeating the same thing over and over and expecting different results is the definition of what? Insanity. Yet here we are, expecting different results from the same self absorbed redunkulous . Yup. Insanity. One of my guilty pleasures these last few years is watching the lifestyles of the pretend rich and crazy on Bravo’s Housewives series. Even I have my limits though and have gotten away from it, they’re just so mean. But one little train wreck down in Atlanta believes herself to be “Gone With the Wind fabulous” and will twirl…with a fan. It’s so deliciously bizarre that when she pops up on the tele, I’ll watch for a bit. But this past week (or whenever the episode aired) she told her father that she wanted to make contact with her mother (the same mommy who told her she never wanted a child; her; and don’t ever contact her) to move on from pain this separation has caused to Ms. Fabulous. Well, that was very sad and of course hit home for me in a sense. When all of a sudden, Kenya’s father threw a bucket full of reality right back at her. Do not expect a different result to this conversation. She hasn’t changed, no matter how much you want her to. She doesn’t want to be a mother, I know that hurts but you’re not going to change it. It was real and it was sad. And familiar. Unfortunately. I was reminded of this last night that even though time goes by and distance is placed, wanting a different relationship with the same people who have brought a dark energy not only into my life but those of my children is absolutely insane. Why would I expect different? Misplaced hope I reckon. The fact that a bucket full of reality was placed on the Oz man and hearing his disappointment in it was almost too much for this confrontational mama bear. Congratulations, your grandson hears loud and clear he’s not important. By the way? GFY. There, that’s something I almost got on the phone and said. Restraint Yo! Insanity. We hear you loud and clear, we’re off the merry go round. Well done. By the way, the 49’rs are supposedly selling his old game day pants. I’m assuming that’s an Onion report. Yes?? Dispute not with her; she is a lunatic. 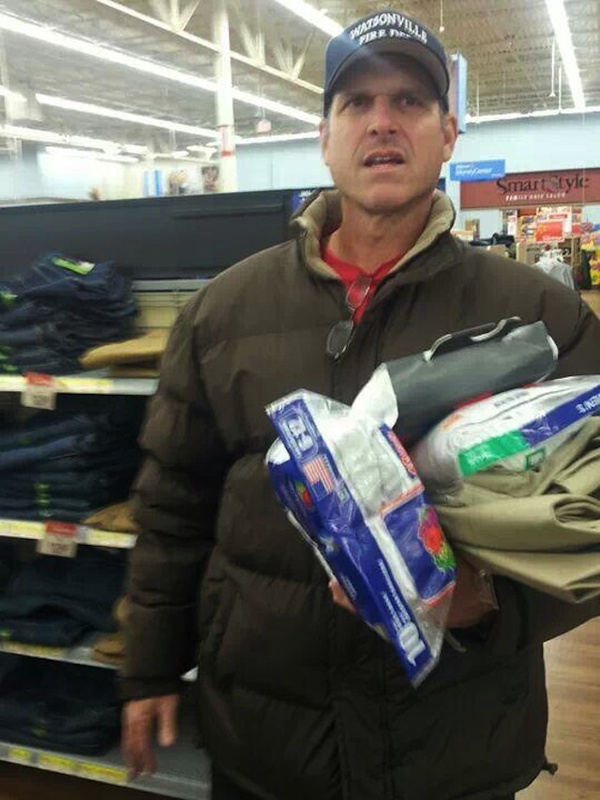 This entry was posted in Uncategorized and tagged Insanity, Jim Harbaugh, Khaki's. Bookmark the permalink.